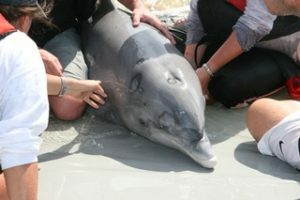 Jax was a juvenille male bottlenose dolphin (Tursiops truncatus) rescued from a fresh water river in Jacksonville, FL. The National Marine Fisheries Service required assistance from GWMI and Harbor Branch Oceanographic Institute (HBOI) to intervene with this already debilitated dolphin. Multiple freshwater skin lesions on dorsal fin, trauma to right pectoral fin and trauma to right fluke. 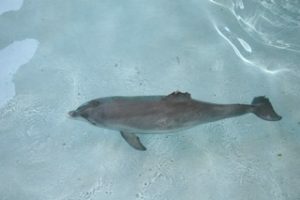 Jax also suffered from a foul blowhole, stomach ulcers, and damage from shark bites. Jax was deemed non-releasable by National Marine Fisheries Service (NOAA) and now calls Dolphin Research Center his permanent home.